The Oldways Whole Grains Council provides several diﬀerent kinds of support to whole grain researchers working in a variety of ﬁelds, including nutrition, agricultural science, and food technology. We love learning about new studies that aim to shed light on the health beneﬁts of whole grains, the nutritional impact of various food processing methods, the projected eﬀects of climate change on crop yields, and other topics of research including sprouted grains, gluten-sensitivity, phytates, and more. We launched the Whole Grain Stamp program in 2005 and today we have more than 400 member companies who use the Whole Grain Stamp on 12,000+ products sold in over 60 countries around the world. Our extensive database includes information about the whole grain content of thousands of foods, and we are able to provide this publicly-available data to researchers in spreadsheet form. 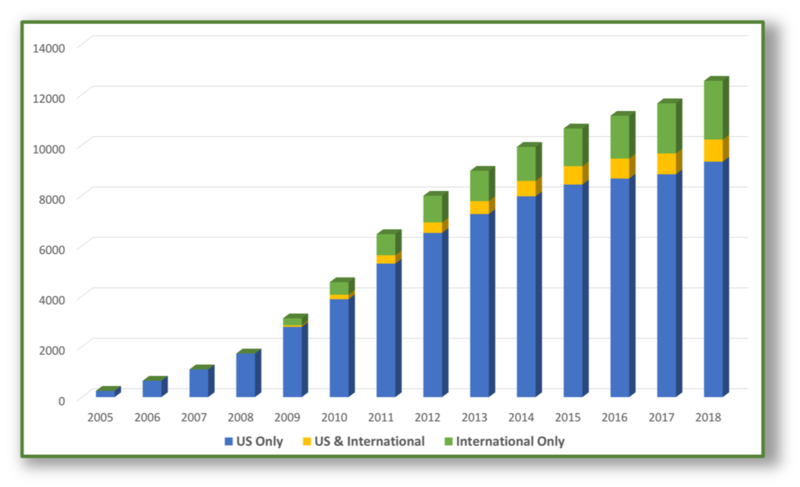 Additionally, we are able to track trends in the use of particular grain ingredients and we have data showing the overall increase in average whole grain content over the past decade. Contact Caroline Sluyter (Caroline@oldwayspt.org) if you’re interested in learning more about these data. When important research has been proposed whose ﬁndings are likely to have a positive inﬂuence on consumption patterns and our understanding of the connections between whole grains and health, we have sometimes been able to provide letters of support to assist in the process of securing grant funding. If you would like us to consider supporting your research in this way, please email us with a summary of your proposed study, along with links to any other related research you’ve had published. When new research is published, we help spread the word to our large audience of consumers and health professionals by including it in our Health Studies Database, and by sharing it in our various newsletters. When your work is published, reach out and make sure we know about it so we can highlight the ﬁndings. 2017 Summary of Recent Whole Grain Health Research – Between 2012 and 2017, more than 100 major studies were published analyzing the health beneﬁts of whole grains, deepening our understanding of why whole grains support good health. This report summarizes the ﬁndings of 112 studies. Sprouted Grains Working Group Phase I Summary Report – Over a period of two years, we worked with 47 individuals from 28 diﬀerent companies, through a series of conference calls, emails, and individual interviews. This summary acts as an overview of the tremendous amount of useful information we gathered, and also as a record of the additional questions that were raised over the course of this project. Our 2018 Consumer Insights Survey – Contact us for more information about the survey we conducted. Whole Grain Statistics– We collect as much industry data, consumer research data, and other relevant whole grain statistics as we can ﬁnd and we summarize and link to them on our website so that researchers and members of the media can get a better picture of where whole grain consumption and sales are headed.